Now that spring is just beginning, brides everywhere are working out design plans with their bakers or searching Pinterest for that perfect wedding cake and cupcake design idea for their beach, navy and gold, or nautical theme weddings. What a fun and busy time for us bakers! But sometimes it's tough finding new and unique design ideas for our clients. 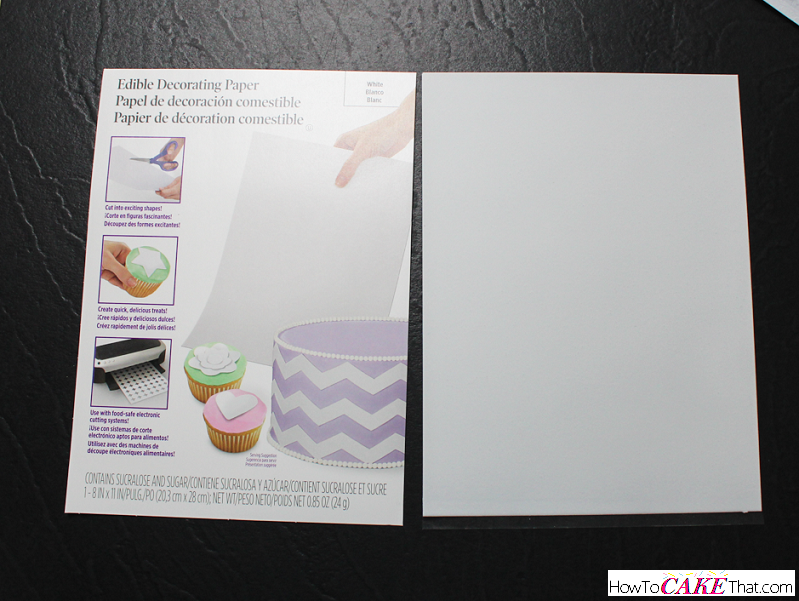 So today I'm sharing a simple, yet elegant, design for a cupcake topper! And today we will be tackling a tough design... stripes! And I will show you what I do to get nice clean perfectly lined up stripes! And I'll also offer a couple of suggestions on alternative methods for quicker and easier ways to make these toppers! I hope you enjoy!! 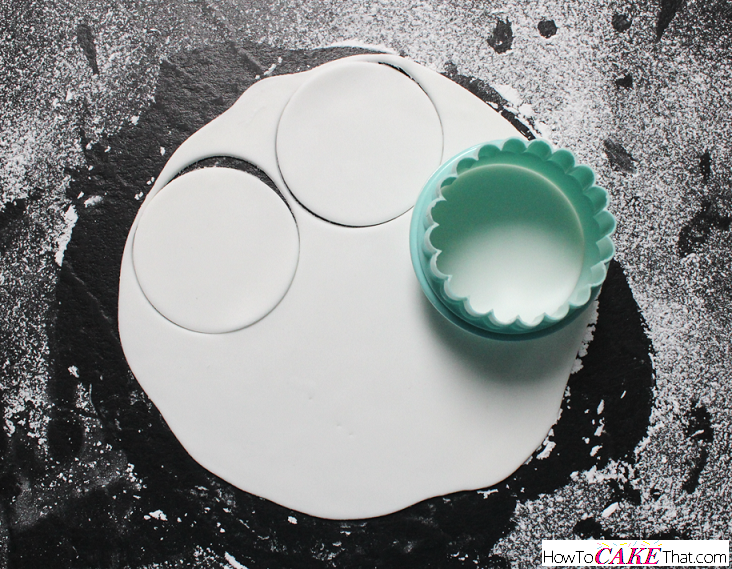 For this tutorial, the white fondant has tylose powder added to it to help it dry faster. 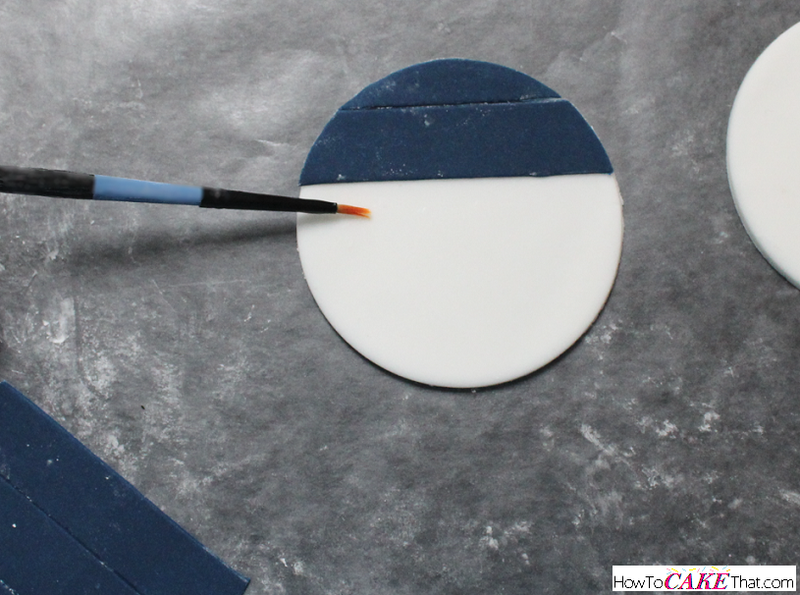 If you prefer, you can just use gum paste, or you can blend fondant and gumpaste together to help the topper disks to dry faster and harder. 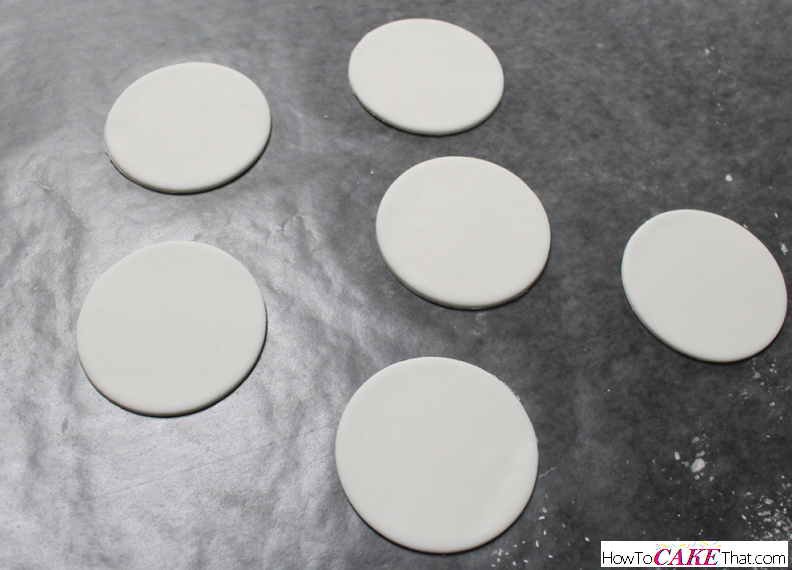 Here I have rolled out my fondant to about 1/8th of an inch thick and used a 58 mm circle cutter to cut out lots of white fondant disks. 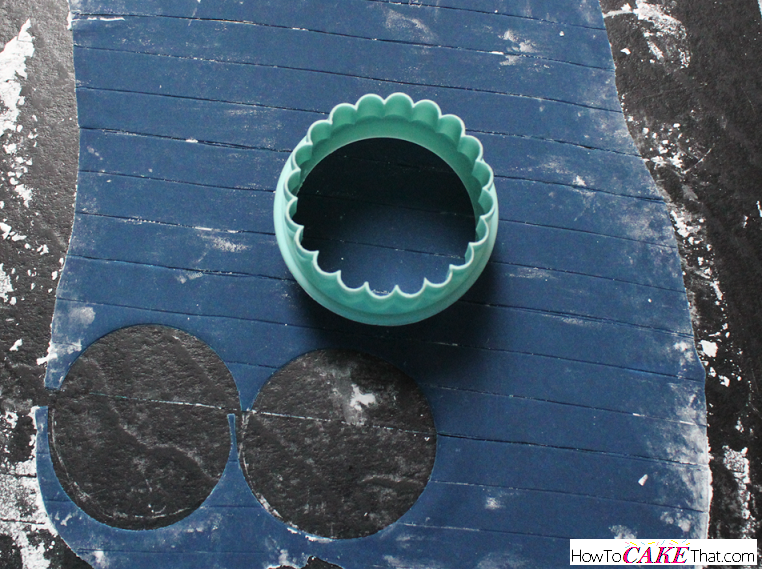 The circle cutter I am using is from a biscuit cutter set by Martha Stewart. 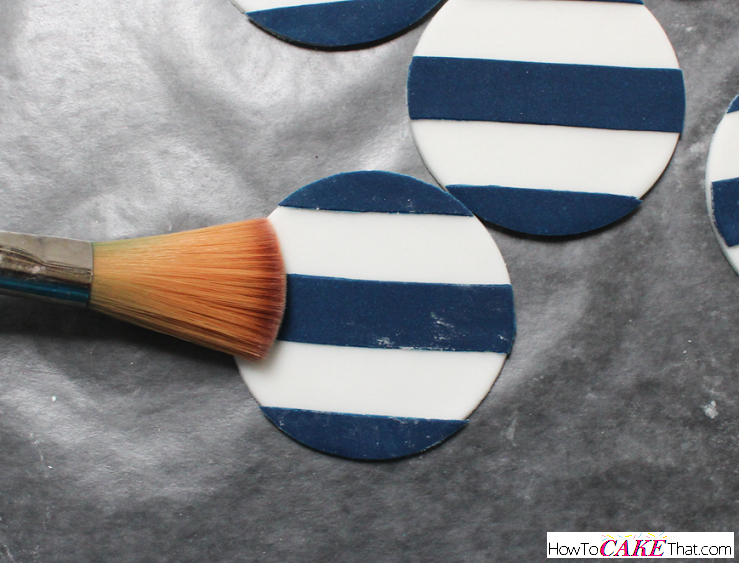 For the stripes I am using fondant that does not have tylose mixed in. We don't want these drying too fast and risk them cracking. 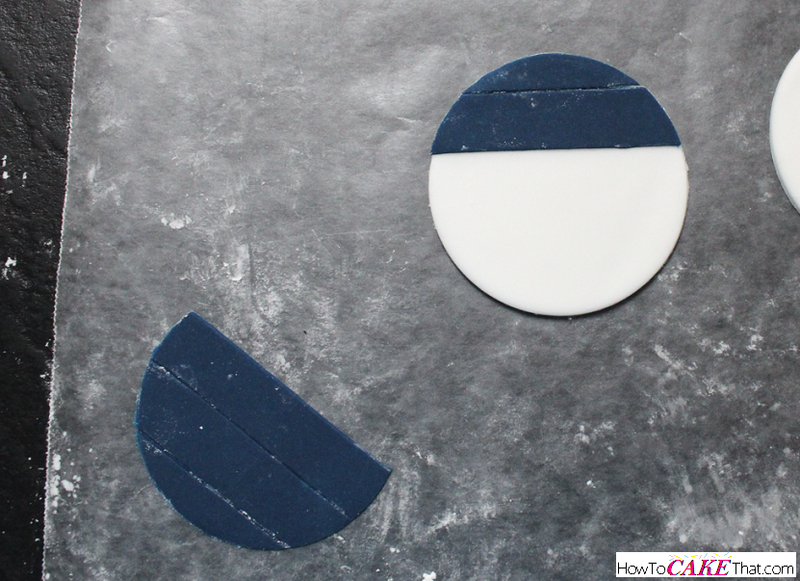 To color my fondant a beautiful shade of navy blue, I used mostly Americolor's navy blue gel color, and then I added a touch of Americolor's violet gel color and a touch of black gel color. I recommend purchasing pre-colored fondant because the amount of gel needed to get this fondant dark enough made it super sticky and wet. I had to let it sit in the open air for a bit to allow it to dry enough to become usable. I rolled the fondant very thin!! As thin as I could get it without it tearing. 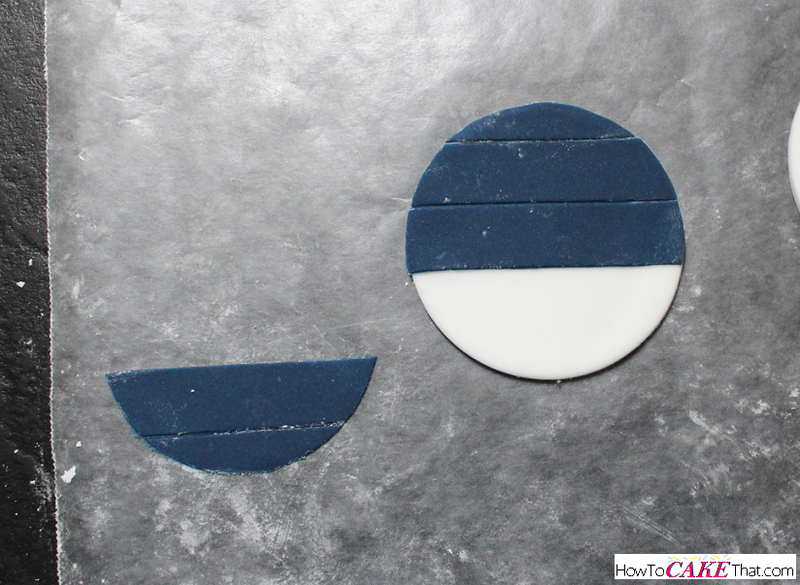 I set my round disk cutters so that they would cut 1/2 inch wide strips of fondant. 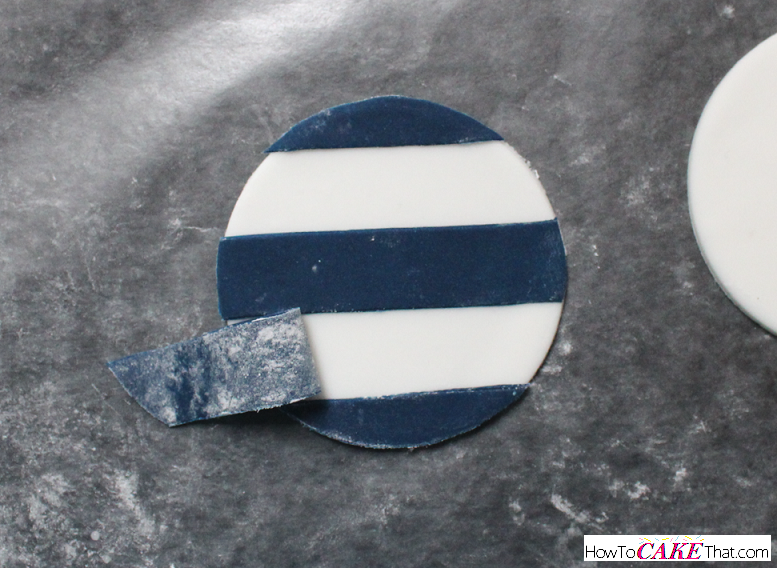 Then I used a fondant ribbon cutter to cut out the fondant. 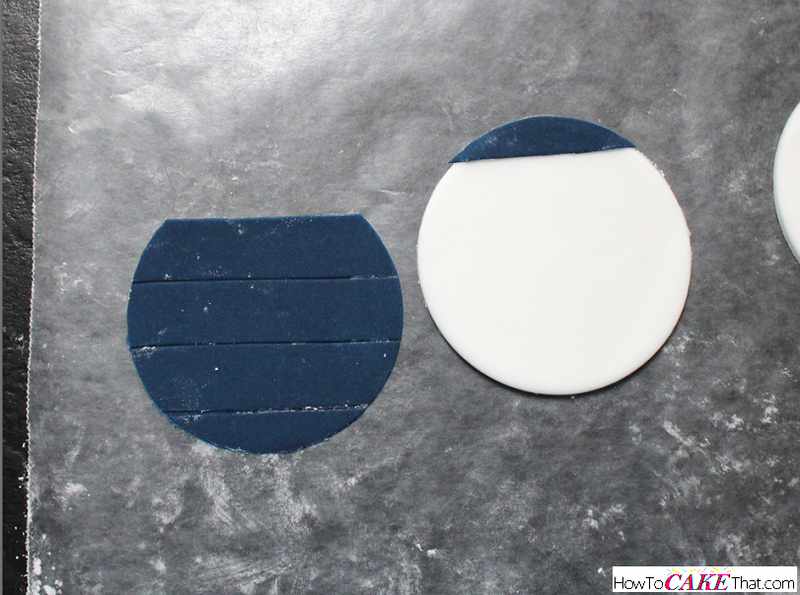 Next, I used that same 58 mm round cutter to cut out round sections in the strips of fondant. I lined up the circle cutter so that one stripe would run perfectly in the center of the circle. 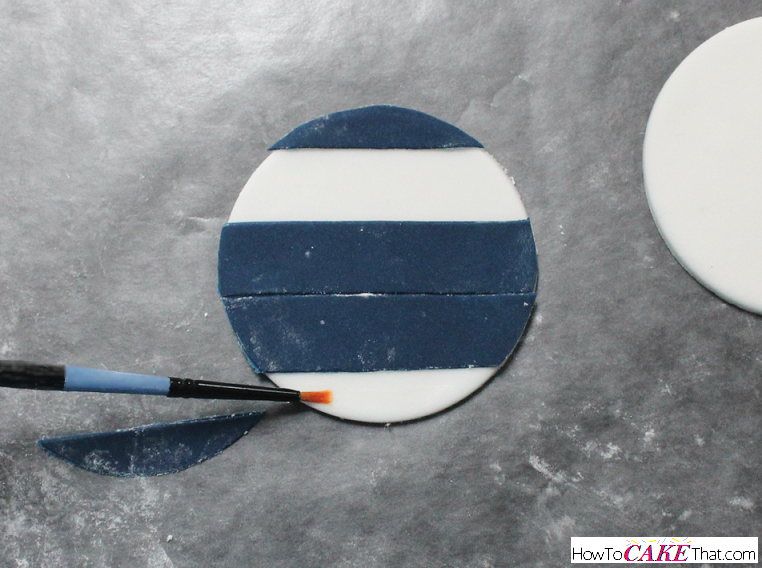 Then I placed the cut circle of stripes next to the fondant disk we will be working with. Next, estimate where the top blue stripe piece will sit and very lightly brush a portion of that area with water or piping gel (I used water). You will just want that area damp enough to hold the stripe in place. Be careful not to add too much liquid or the blue color might bleed onto the white stripes. Then carefully lift and place the first stripe at the top of the white circle. 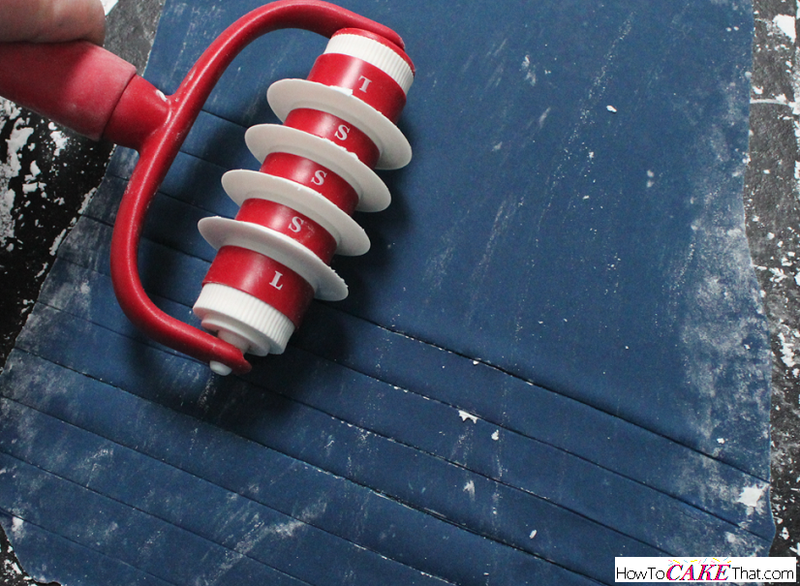 Be very careful when lifting the blue stripe so that it doesn't get stretched or warped. I used my Xacto knife and slid the blade under the stripe to help lift it onto the white disk. Now for this second stripe, we will NOT be brushing water underneath of it! We don't want this stripe to stick to the disk. This one will just be placed on the disk to be used as a spacer to help us line up the middle blue stripe. Now that the second stripe is in place. It's easier to estimate where the middle stripe will sit. Brush the area very lightly with water (or piping gel). Then very carefully place the middle stripe onto the white disk making sure that the stripe is centered and that both ends of the stripe line up with the edges of the white disk. Then remove that second stripe to reveal two perfectly placed stripes! Then to add the last stripe on the bottom, place the next to the last stripe on the disk (be sure not to brush any water or piping gel underneath!!) 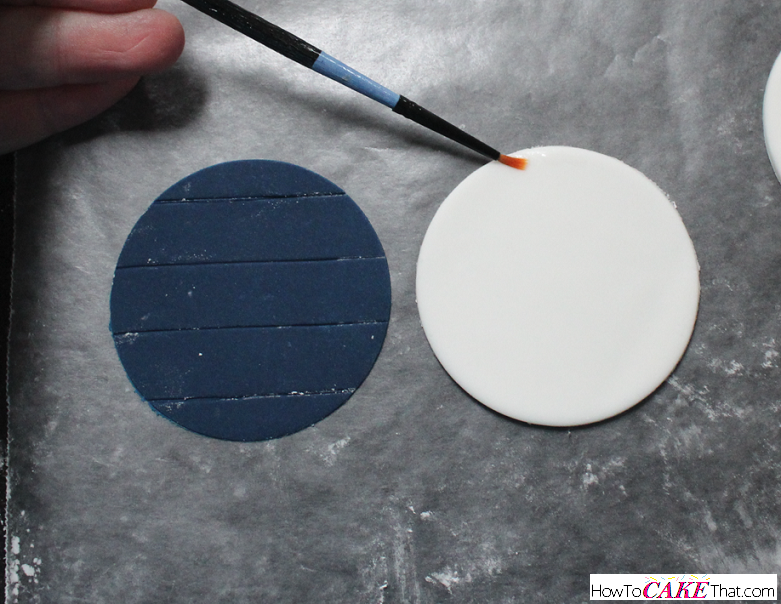 and then brush the area of the disk where the last blue stripe will go with water or piping gel. Then attach the bottom stripe and carefully peel away the one above! 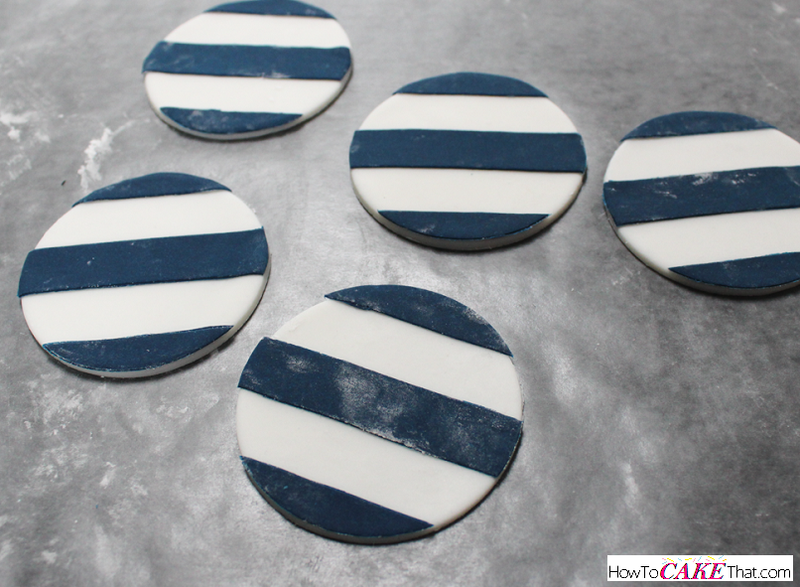 Note: To get this look a whole lot faster and easier, and edible image of navy and white stripes can be printed and round disks can be cut from the edible image and adhered to dried gum paste disks! Easy peasy! First, I cut a strip from the sugar sheet that is tall enough to cut the word from my paper punch. Be sure to remove the plastic backing from the sugar sheet. Here I am using a large punch by EK Tools which I purchased from Michaels craft store. 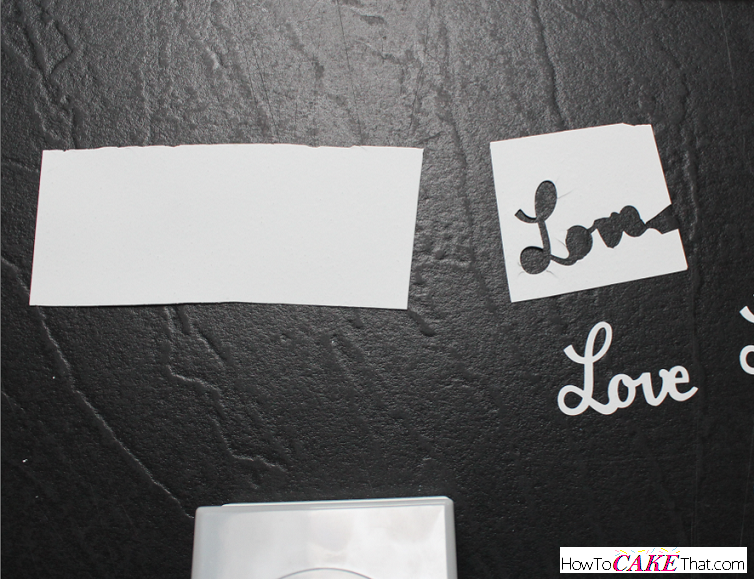 And I placed my sugar sheet into the punch and cut out the word "Love"
You'll notice that when punching out the word from the sugar sheet that the sheet cracks around the cut word. To prevent the first cut from ruining your next, you must cut that piece away from the rest of the sheet after each punch. 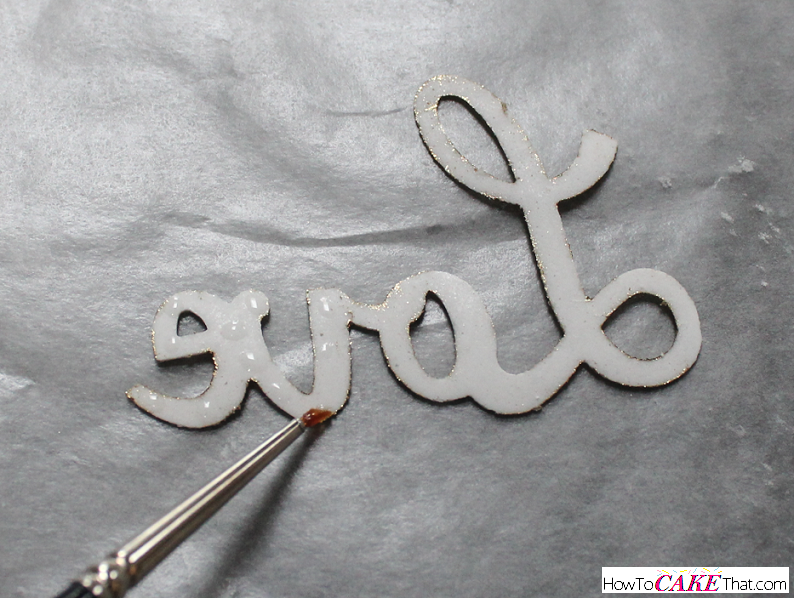 Next, I placed my sugar sheet words onto a sheet of wax paper. 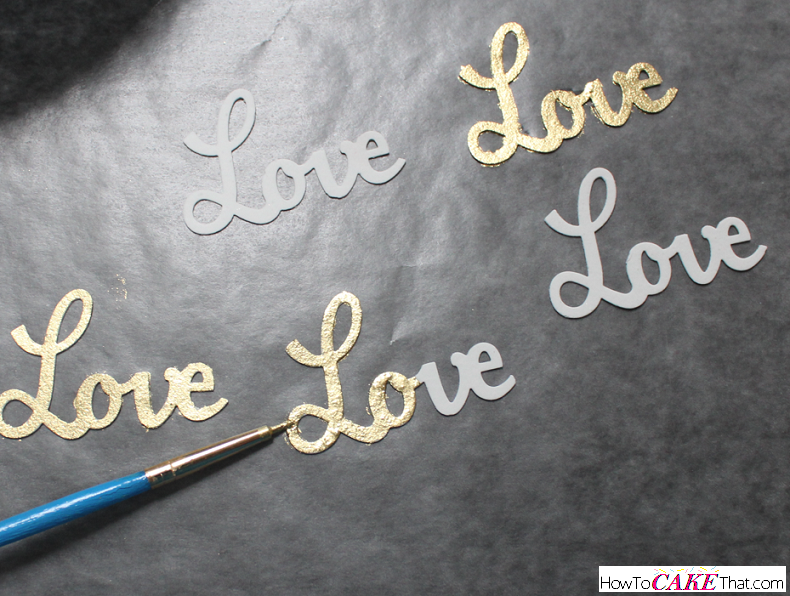 Then I created a paint using gold luster dust and vodka and painted each word. Then I let them dry for several hours. Once the disks have dried, it's time to clean them up! 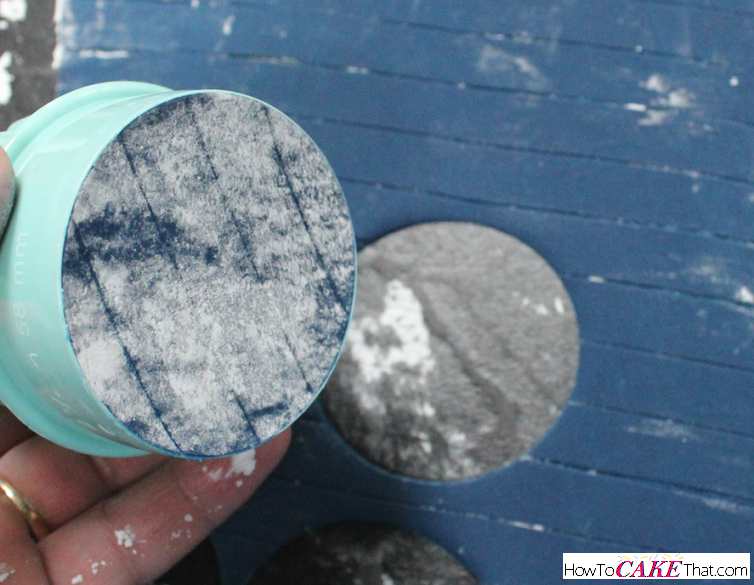 I used a large soft brush to dust away all of the cornstarch powder on the disks. To attach the words, I flipped each one over and worked one at a time. I used a fine tipped brush and dotted the tiniest bit of piping gel onto the back of each word. Be careful not to add too much... we don't want the piping gel to squish out from underneath the word ;). Then I placed the word onto the disk and pressed it in place to help it stick. I just love how brightly the gold shines!! It's so beautiful!! 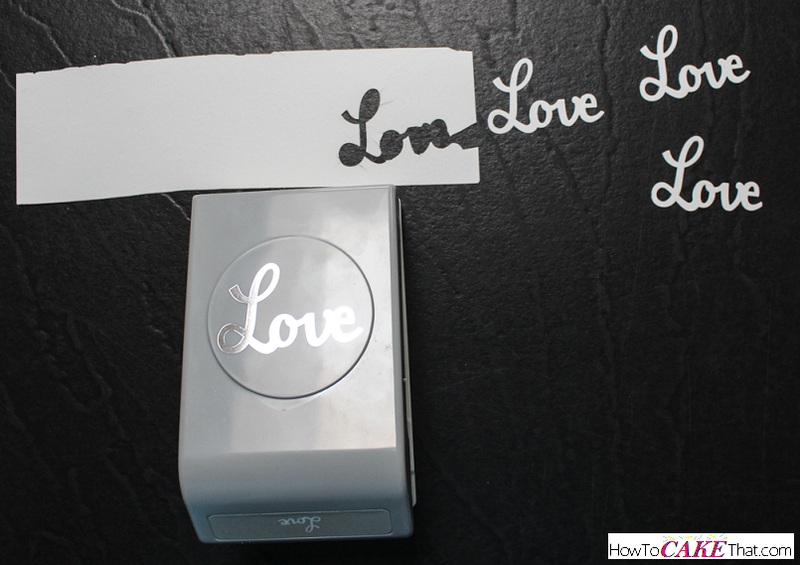 NOTE: If you are afraid of not being able to line the word up correctly, a very simple way to make a template would be to punch out the word love on a plain sheet of paper. 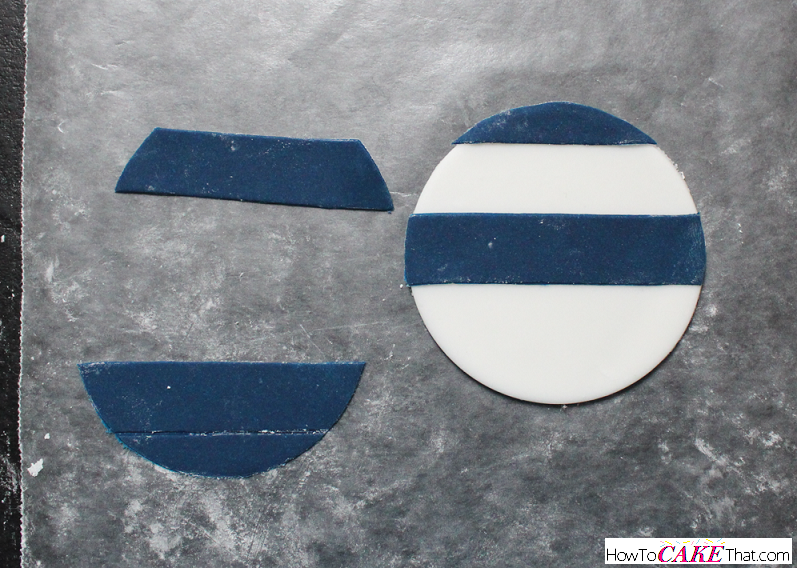 Then using the large piece of paper that the word was cut from, line up your circle cutter (same size as your fondant disk) around the area where the word love was cut out and center the word in the middle of the circle cutter. 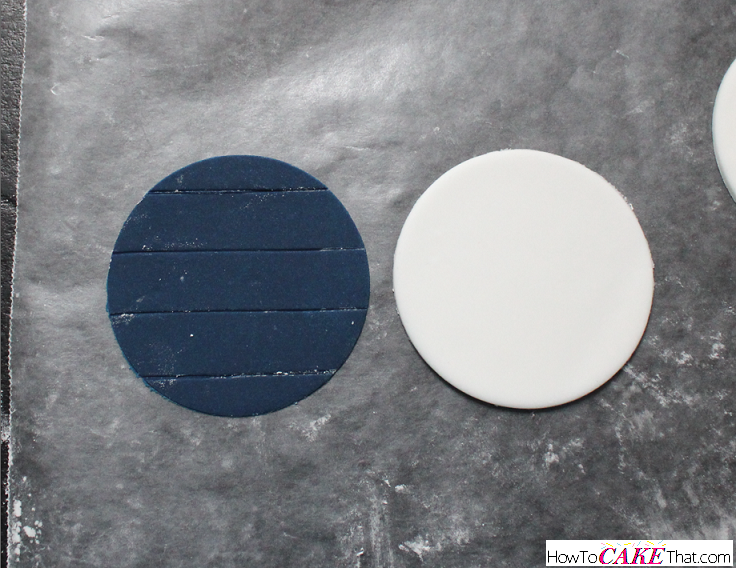 Use a pencil to trace around the circle cutter. Then use scissors to cut out the paper circle. 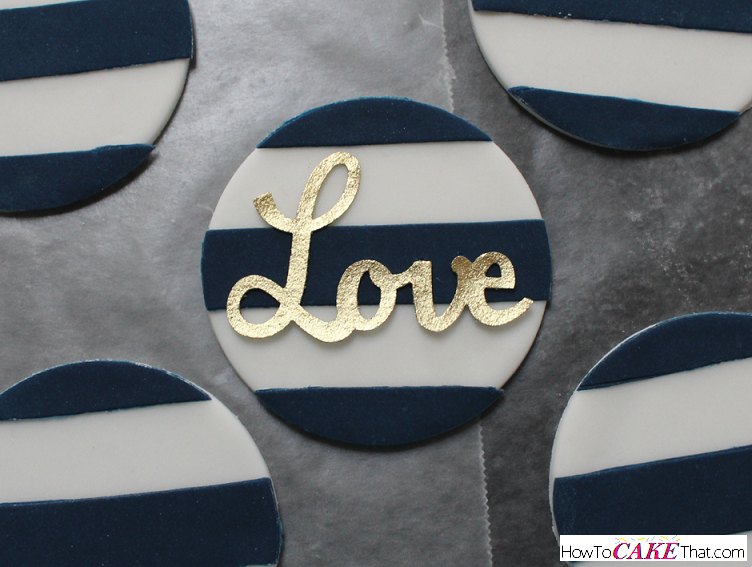 Now you have a round template the exact same size as the fondant disks, Lay that piece of paper over the disk and line up the word Love with the blue and white stripes. 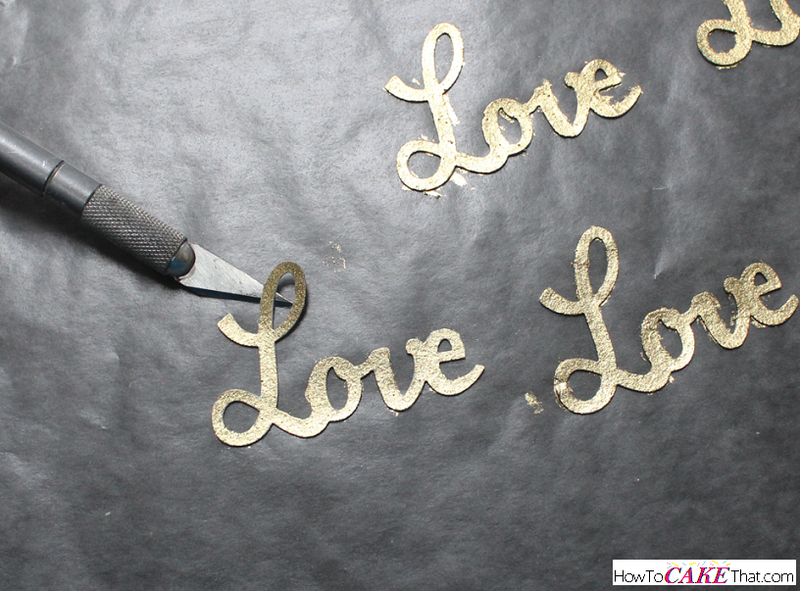 Dot piping gel directly onto the disk where the cut out word Love is in the paper. Then, line up your edible "Love" cutout with the paper template and place it directly on the disk inside of the cutout area of the paper. 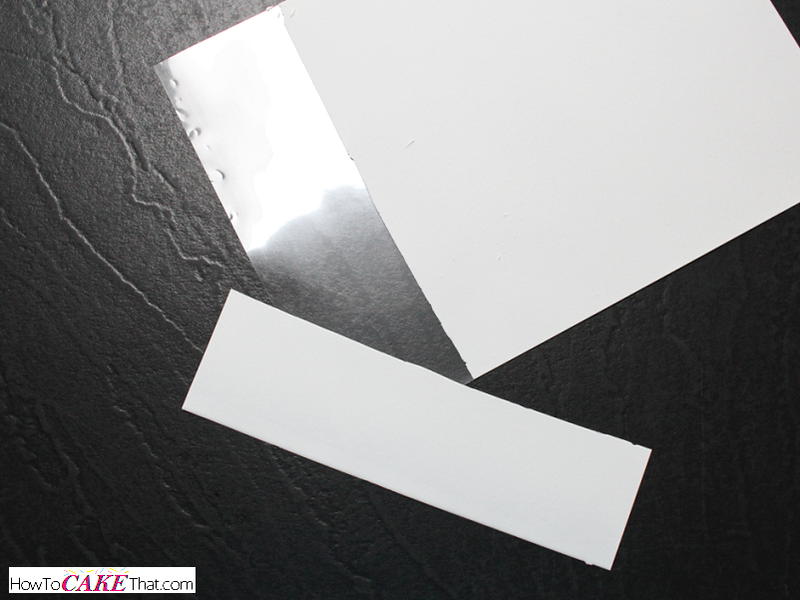 Then carefully remove the paper template from the disk! And viola! You now have a perfectly lined up topper! PS. If you guys want to know how I got that gorgeous shade of peach for the rosette swirl cupcakes, I used my very vanilla buttercream recipe and colored it with Wilton's Peach gel color and added just a touch of Wilton's orange gel color. The peach gel color by itself looks pink, so adding the lightest touch of orange helps give it to a lovely peachy tone.